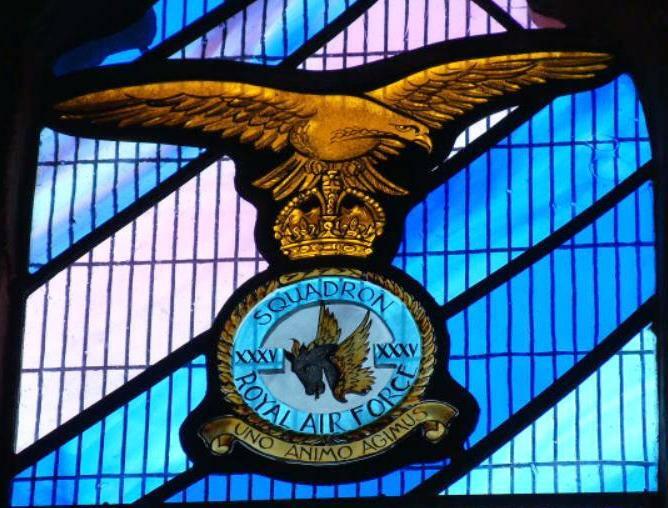 All Saints is honoured to house the Official Memorial to the 35 Squadron: a stunning stained-glass window designed and installed by Gordon Monaghan. This Memorial Window was unveiled on Sunday 15th November 1998 by Mrs Ly Bennett, wife of the late Air Vice Marshal Donald Bennett. Don Bennett had joined the RAF in 1930 but resigned in 1935 to return to his native Australia. In 1936 he joined Imperial Airways as a Flying Boat Captain. In 1941 Bennett returned to the RAF as an Acting Wing Commander in command of an Air Navigation School; in December that year, he was given command of Bomber Command’s 77 Squadron (Elvington). On 5 July 1942 Bennett, now an Acting Group Captain, was given Command of Bomber Command’s new Pathfinder Force – whose job was to Find & Mark Targets for Main Force Crews. In January 1943 Bennett was again promoted, to Air Commodore, and placed in command of Bomber Command’s 8 Pathfinder Force Group. After the War Bennett also designed and built several Light Aircraft & Cars. He died on 15 September 1986. 1st we have the Eagle Symbol of the RAF. This design was originally approved at an Air Council Meeting on 1 August 1918, 4 months after the Formation of the RAF on 1 April 1918. Below the eagle is the badge of 35 Squadron RAF. Motto: Uno animo agimus (We Act with One Accord). Badge: A Horse’s Head Winged. The Badge commemorates co-operation with the Cavalry during WW1. Authority: King Edward VIII, October 1936. The Dove is the symbol of Peace, reminding us that these Airmen were Fighting to defeat the Evil that faced us in the World at that time. This part of the Window shows one of the Handley Page Halifax Mk III aircraft used by 35 Squadron at RAF Graveley from 1943 to 1944. Though 35 Squadron served throughout the War they were only at Graveley from 1942 to 1946, also being one of the Founder Squadrons of the Pathfinder Group. RAF Graveley was the 1st Operational RAF Airfield to use a device known as FIDO (Fog Investigation & Dispersal Operation). It had 2 Pipelines along both sides of the runway and petrol was pumped along them and then out through burner jets positioned at intervals along the Pipelines. The Vapours were lit producing Walls of Flame which lifted the Fog allowing Aircraft to land safely. Shortly after 2 other FIDO Airfields were also urgently Commissioned : (Downham Market & Fiskerton, close to Lincoln). RAF Graveley was the 1st operational RAF Airfield to use a device known as FIDO (Fog Investigation and Dispersal Operation). It had two pipelines along both sides of the runway and petrol was pumped along them and then out through burner jets positioned at intervals along the pipelines. The vapours were lit producing walls of flame which lifted the fog allowing aircraft to land safely. Shortly after 2 other Airfields were also urgently Commissioned : (Downham Market & Fiskerton, close to Lincoln). The Churches represent the 2 Villages set amid pleasant fields & woods reminding us that Peace did return to the Country after 6 years of Conflict. Though the Airfield itself is called Graveley, which is where the Main Gate was located, most of it is within the Parishes of Offord Darcy & Offord Cluny. The bottom line of the Window can be interpreted in 2 ways. Perhaps as the River Great Ouse that links the 2 communities or the sky in various shades of blue to black, remembering that the Aircraft flew by Day & by Night. An Airmans Prayer – by Sgt. Observer Hugh Rowell Brodie, 460 Sqn RAAF KIA 2nd June 1942 aged 30. During WW2, Bomber Command of the Royal Air Force was the only Weapon capable of striking directly at the Heart of Nazi Germany. Despite this, its effectiveness was limited because its power could not be focussed precisely enough onto individual Targets. In 1941, the idea of a Special Force being established to lead the Main Bomber Streams was conceived. There were to be 6 Squadrons, Based close to each other and with their Aircrews enriched by 40 of the Command’s most experienced Aircrew. Thus, on August 15th, 1942, the Path Finder Force (PFF) was established, to be Administered by No.3 Group in Headquarters at RAF Wyton. 109 Sqn was to develop and Test Oboe, a Radar Aid to Pinpointing Targets and guiding Aircraft to the Spot. The Force also had a Radio Navigation Aid, H2S. Flares were developed which, when dropped, would mark a Target for some time whilst not dazzling Bomb Aimers. In 1943, the PFF became a separate Group, No 8, and was recognised as a highly effective Force. An Aircrew posting to the PFF was conditional on 2 things; 1st, you had to Volunteer. Secondly, you had to accept a Tour of Duty of 45 sorties – half as long again as a normal Bomber Tour. By April 1943, the PFF was augmented by 2 Lancaster Squadrons, 405 Sqdn Royal Canadian Air Force, based at Gransden Lodge and 97 Sqdn at Bourn. Later that year, Group Captain Don Bennett, the Force Commander, moved his HQ to Castle Hill House in Huntingdon and the number of PFF Squadrons was increased. By the end of the European War in May 1945, the PFF had flown a total of 50,490 Sorties against 3,440 Targets. The men who flew the Missions knew the risks were very great and that they would be in danger much longer than regular Crews. They would Mark a Target and then circle the area, now wide awake to the Attack, to guide in the Main Force. In some compensation, the Crew members were given advancement of one Rank for the time they flew with PFF and, on successful completion of Missions, a simple, small, Brass Eagle in flight, to be worn above the left breast pocket. Many of the Uniforms, some preserved in the PFF Museum in RAF Wyton, have hastily added Rank Braid, always looking newer than those which had already been worn on the previous 30 “Regular” Missions. The number of PFF Aircrew Killed on Operations, en-Route, over the Target, even trying to find a Base able to accept landing on Return where Fog had closed off so many and Fuel was Low, totalled 3,727, including 3 PFF Pilots, Bazalgette, Palmer and Swales. Thousands of men from all Nations flew with bravery & dedication on Operations with RAF Bomber Command during WWII, 8953 Aircraft were lost & 55,573 young men made the Ultimate Sacrifice.